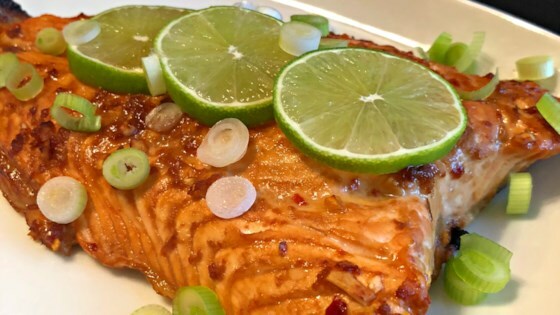 "Salmon with a spicy Asian-style twist." This recipe is fabulous! I cooked it in foil in the oven at 425 for 20 minutes and threw in slices of red pepper too, which were amazing with the sauce. I will make this again and again! This is good! I added a little soy sauce, rice wine vinegar, a shake of sesame oil, olive oil and used it as a marinade. I served it with a cucumber salad on top, yum, yum!